William LaRue Weller’s story is perhaps a somewhat typical one of successful men and women of the American 1800’s. There’s war, there’s tragedy, there’s family, there’s dogged perseverance, and there’s whiskey. Weller was pretty much born into bourbon making. His grandfather, Daniel, was operating a distillery close to Bardstown, KY as early as 1800. His father, Samuel, followed in his dad’s footsteps soon after he returned from the War of 1812 (the one where, just for emphasis, the American’s beat the English again, but were denied the chance to own a bunch of Canada). W.L. Weller himself fought in the Mexican-American War (the one where America continues its greedy ways and, on the back of some fairly dubious claims, fights Mexico to gain control of California, New Mexico, and Texas), and upon his return founded the William LaRue Weller & Brother whiskey company with, you guessed it, his brother Charles D. Weller (no, not that Chuck D.). Weller’s sons, William, George, and the adopted John, fought for the Confederacy in the American Civil War (the one where the South fiercely fought against the government telling them what to do, while simultaneously fighting for their presumed right to tell others what to do…a horrendous double standard that permeates U.S. politics even today, but that’s neither here nor there) and then joined their father and uncle in the distillery. In the early 1860’s, LaRue’s brother, Charles, was shot and killed during a robbery in Tennessee, which understandably prompted a name change in 1876 to William LaRue Weller & Son. Whatever the name, the Weller family was doing something right, by 1880, their whiskey was so popular that is was being shipped as far as Reno, Nevada. In 1893, the Wellers hired a young, apparently extremely gregarious salesman named Julian Van Winkle, who went on to become part owner in 1908. Van Winkle’s collaboration with Frederick & Philip Stitzel is, of course, the stuff of 20th century whiskey making legend, but that’s story for another post. Today, the W.L. Weller brand is owned by Buffalo Trace and appears on the shelves in four expressions, the Special Reserve, a 107 proof Antique,this 12 year old, and the Buffalo Trace Antique Collection bottling. The Nose: Pretty darn luscious, butterscotch and vanilla bean mixed with stone-ground wheat crackers. A toasty, baked fruit sweetness as well…apple pie, a little baked/fried banana even. Softer, cinnamon spice notes, and tannic wood notes hover just in the background. A nice mix of sweetened grain and the many years spent in oak. The Palate: Slightly oily mouthfeel with bright opening notes of honey, burnt toffee, and a bit of citrus. Cracked wheat and toasted bread make an appearance to help transition to more spice and wood tones. Ends with cinnamon, wood char and tannins, the last of which gets a little overblown comparatively right towards the end, but still works. The Finish: Sharp, oakey, char lingers with fainter toasted honey-wheat grain. Thoughts: Excellent stuff that wears its “wheater” style proudly. It’s hard not to compare this 12 year old with another wheated bourbon, the great Van Winkle 12. I prefer the Van Winkle, but then again, I prefer the Van Winkle to most whiskies, plus it’s a lot more expensive and damn hard to come by these days. 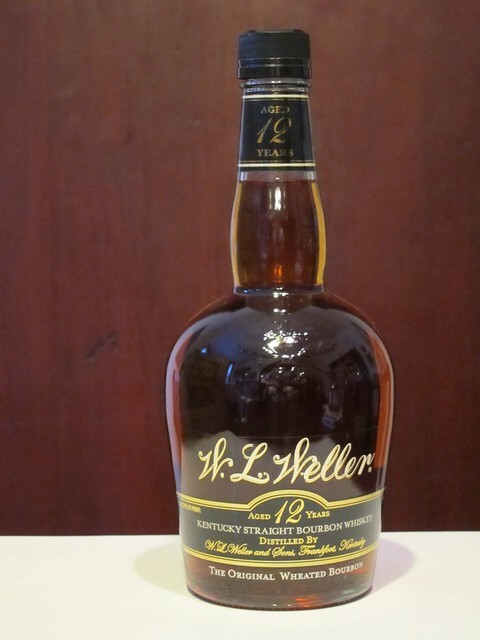 This Weller 12 yo has a wonderful, expressive nose and a delicious, complex palate whose perhaps only shortcoming is the slightly overwhelming presence of wood towards the end, which throws off the balance a bit. However, for around $25-$28, that’s nit-picking, this is a terrific whiskey, and an absolutely fantastic value. Highly recommended…no, on second thought, let’s make it required reading if you’re a bourbon fan. I believe that you were referring “The War Between The State” which terminated in 1864 whereas the referenced “Civil War” is on-going.